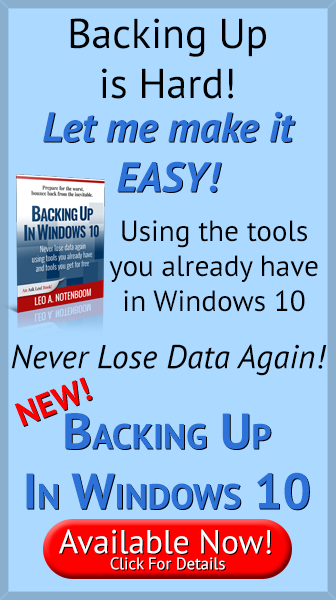 An Eight-step Back-up Plan Using Windows 10's Built-in Tools - Ask Leo! Eight steps to a backup strategy using Windows own built-in tools, plus four more to handle Microsoft's plans to retire one of those tools. I’m sure you’re aware by now that I’m a huge fan of backing up. Microsoft Windows includes several tools that, used together, can provide a backup strategy to protect you from most of the things that can go wrong. Let’s review what it means to use those tools together properly and get you backed up. We’ll also review the impact of Microsoft’s decision to phase out one of those tools. Start by making an image backup of your computer. It doesn’t matter if you don’t know what to do with it — that’ll come later. By creating an image of your computer, you’ll have a known point to which you can always return should anything go wrong in the future. 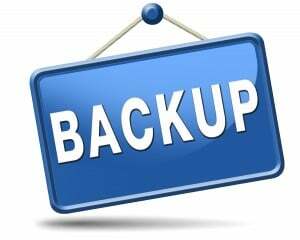 Creating a Backup Image Using Windows’ Built-in Backup walks through the steps to create a complete image backup of your machine on an external hard drive, using what Windows 10 calls the “Windows 7” backup and restore tool. Next, I recommend making a Windows recovery drive. This is a disk (a DVD or USB thumb drive) from which you would boot your machine in order to restore the image you took in the first step. The Windows recovery disk also includes additional tools to examine and possibly repair your system, as well as the ability to reinstall Windows 10 from scratch if needed. Create a Windows 10 Recovery Drive illustrates the process of creating a recovery drive. You may also want to review the article How do I boot from CD/DVD/USB in Windows 8 & 10? and test to make sure you can boot successfully from the recovery drive you’ve created. Restoring an image is the process of taking a backup image you’ve previously created and putting it back on your computer’s hard drive (which erases anything currently on that hard drive). An image restore is what you would do after replacing a faulty hard drive with a new, empty one. Restoring an Image Backup Using Windows 10’s Built-In Backup uses the image we took in step 1 and the recovery drive created in step 2, and demonstrates the process of restoring that image to your computer. I rely on image backups primarily because there’s no question about what’s in them: everything. But sometimes you don’t want to restore everything; you just want a single file, folder, or collection. Microsoft doesn’t make it obvious, but you can do that with a backup image you create using the Windows backup tool. Restore Individual Files from a Windows Image Backup shows you how. With image backups under our belt, we can move on to more “in the background” backups in the form of File History. File History sets aside some amount of space on your hard disk (ideally an external hard disk, and possibly the same one containing your backup images) to which it writes copies of your data files each time they change. Using File History, you can recover a file as it was an hour ago, a week ago, or some time in between, depending on how often files change and how much space you’ve set aside for it. Enable File History in Windows 10 tells you how to set it all up. After you’ve had File History running for a while, you’ll surely encounter a point where you want to recover a file that has been backed up. Learn to browse what’s been backed up, locate the file or files you want, and restore them in Restoring Files with File History. Backing up to a completely different physical location — “offsite” backup — has never been easier with the advent of cloud storage and synchronization tools like OneDrive. Using OneDrive for Nearly Continuous Backup not only shows you how to set up and configure OneDrive itself, but also discusses a couple of simple changes to your workflow that result in almost continuous cloud backup of all your work in progress. Just like File History, the day will come when you need to recover a file that’s been backed up to the cloud. Recover Deleted Files in OneDrive points out that OneDrive has a Recycle Bin from which you can recover deleted files. As a bonus, Recovering from Ransomware with an Online Backup discusses how it can even save you from ransomware. Used together, these eight steps and three tools (image backups, File History, and OneDrive) can provide an adequate level of backup for the average user. Best of all, you already have them in Windows 10. Apparently, Microsoft has decided to pull the plug on the “Windows 7 Backup and Restore” tool in Windows 10. It is at least “deprecated”, and will likely be removed from a future Windows 10 update. The official word from Microsoft is that you should use third-party utilities instead. The following bonus four steps do exactly that: show you how to perform steps 1 through 4 above using the free edition of EaseUS Todo, instead of Windows 7 Backup and Restore. Creating a Backup Image Using EaseUS Todo Free illustrates how to create an image backup of your system to your external hard disk. Creating an EaseUS Todo Emergency Disk displays the process of creating a recovery disk — what EaseUS calls an “emergency disk” — that can be used to restore an EaseUS Todo image. It won’t have the additional tools the Windows recovery disk created in Step 2 had, so you may want both, but you’ll need an EaseUS emergency disk to be able to restore images created by EaseUS Todo. Restoring an Image Using EaseUS Todo tells how to restore a backup image created by EaseUS Todo to your hard disk, replacing everything on it. Restoring a File from an EaseUS Todo Image Backup EaseUS Todo makes restoring individual files and folders from an image backup quite easy. Backing up is important. I say it so often because it’s so true. I also say it because I see so much data loss, and accompanying heartbreak, as people don’t realize just how important it is until it’s too late. You can use the steps above to make sure you’re appropriately backed up and never suffer data loss again. The articles listed above have been collected into ebook form — Backing Up In Windows 10 — available now. Top-to-bottom, end-to-end, Backing Up In Windows 10 will walk you through all the steps you need to keep your data safe, using Windows 10’s built-in tools, as well as a free alternative. « Previous post: How Do I Delete Multiple Emails When I Have a Lot to Delete? I use BackUp4All to make non-compressed mirror backups on two separate external hard drives, in addition to other steps you list and do not list. Over the years I have recovered from two hard drive failures that way. BackUp4all has been faithful for many years. Since I have Office 365, I have a TB of OneDrive storage included. I have all of my personal files in my OneDrive folder. I also do daily incremental or differential backups (depending on which computer I’m using). Is there much advantage of using File History in that case? It’s marginal, I would think. The advantage might be an easier recovery interface in which to browse old versions? And it would be faster as well, not having to go across the ‘net. Lots of so called ‘free’ tools are only free for noncommercial use. Thats a problem for folks who want to back up their work machine and don’t have their own expense account. Hopefully a business would have enough to invest in a tool for commercial use. My computer uses Microsoft BitLocker drive encryption. How does this affect doing backups/restores/… with EaseUS ToDo, if at all? leo, Using inbuilt tools of Windows 10 is enough? what’s your view? Read the the links in the article you are commenting on. They discuss that question. I use a free tool from Veeam: Veeam Agent for Microsoft Windows Free (https://www.veeam.com/windows-endpoint-server-backup-free.html). It does a complete image and then incremental backups. You can restore the whole system or individual files. It also recommends creating its own recovery disk, which I did. It’s just another alternative to your EaseUS Todo. Also agree with using File History in addition! I am a huge fan of using the builtin IMAGE backup and then daily Windows 7 style FILE backups. I have recovered from failed drives, failed updates, and restored to a new drive (lately an SSD) all with just these. Because of that, I trust these tools. This gives me two image backups from which to start. For really really critical systems I create IMAGE backup on more than one drive and/or copy the backup to another computer. I have also created an image backup across the network but I find the 2 TB external USB 3 drives just about perfect for this. Note that external drives larger than 2 TB are GPT formatted and are not seen when the recovery or repair disk is booted. This scared me to death once until I realized I could copy the needed image backup to a 2 TB drive. One other point: While creating a repair optical disk works (if you have a working optical drive!) I found out I could go to the Window Media Creation site and create a bootable Windows 10 installer thumb drive. That drive can also be used to restore an image. Do be prepared, though: Microsoft has stated its intention to remove the included “Windows 7 Backup” functionality from a future update to Windows 10. The very fact of them naming it “Windows 7 Backup” seems to imply that. I wonder if they will remove the ability to CREATE those backups but (at least for some time) provide an ability to RESTORE from them. I also presume that IMAGE backup will not go away. For now, this works very well for me, has “saved my bacon” more than once, and obviates the use of third-party backup software. I’ve had horrible luck in the past with various backup programs. Symantec Backup Exe holds a high position on my dishonor roll. I remember the horror of finding that my QIC cartridge tape backups were not usable when I desperately needed them (a long time ago – in the ’80s). This was when I learned the hard lesson that if you have not verified your ability to restore, you do not have backups! The know-it-all former CTO of the main company I work now with was enamored of Bacula and had it set up on all his systems. He has now at least TWICE lost significant data including mailboxes on his primary email server. Impressive, eh? At the moment I’m concerned that our current main developer is a bit too reliant for my tastes on GitHub not losing data. I make sure that I have copies of our repositories on a regular basis. When Windows 7 Backup goes away the ability to create an image backup from within Windows will go away — until you install a third party tool like Macrium Reflect, EaseUS Todo, or others. I would not expect the restore ability to be preserved either, but I could be wrong.